Habitat: Dark-Eyed Juncos live in a variety of places. They can be found in brushy areas, city parks, suburban areas, forest areas, greenbelts, towns, and yards. 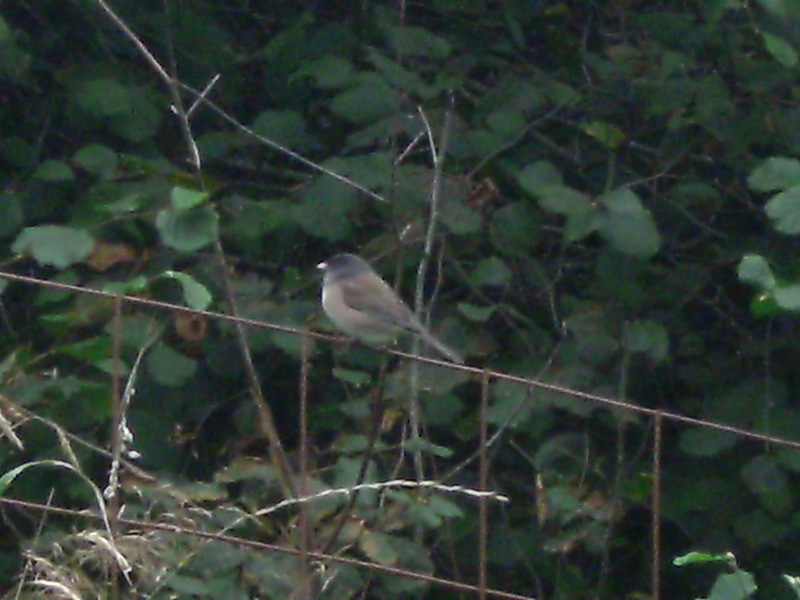 Dark-Eyed Juncos live in open coniferous and deciduous forests. They are often found in pine, douglas fir, spruce, oak, maple, and aspen trees. Diet: Dark-Eyed Juncos eat mainly seeds, but in summer they also eat insects, and the chicks eat mostly arthropods. They eat beetles, ants, caterpillars, butterflies, flies, and wasps. The seeds they eat include millet, chick weed, buck wheat, and sorrel. 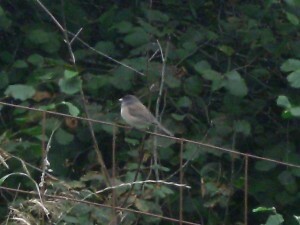 Sound: The Dark-Eyed Juncos’ calls are a series of short tew! notes, and the song is a trill of 7 to 23 notes. Nesting: The Nest is usually placed on the ground, often in a depression or dip. It is hidden under grass, a rock, or a log. Dark-Eyed Juncos make their nests out of lichen, moss, rootlets, grass, and twigs, and line them with feathers, grass, and hair. The nest takes 3 to 7 days to build, an when it is finished it is 3 to 51/2 inches across. Dark-Eyed Juncos lay 3 to 6 eggs, and incubate them for 12 to 13 days. Forms: There are 6 different forms of the Dark-Eyed Junco–Slate-colord Junco, Oregon Junco, Pink-sided Junco, White-winged Junco, Red-backed Junco, and Gray-headed Junco. Description/field marks: The Dark-Eyed Junco is a medium sized sparow of about 51/2 to 6 inches long, and a wingspan of 7 to 10 inches. All forms of the Dark-Eyed Junco have white outer tail feathers that show in flight. 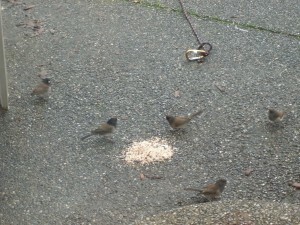 Behavior: Dark-Eyed Juncos come and go from feeders in groups of about a dozen. They seem to hop more than walk as they forage for seeds and insects on the ground. They also glean insects off of leaves and twigs, and scratch in the ground litter with their feet and bills to uncover food. 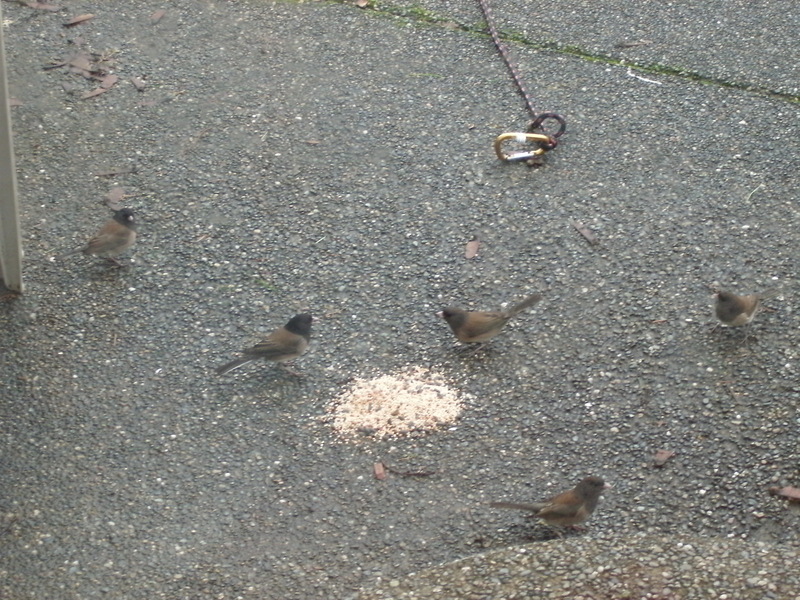 How to attract: To attract Dark-Eyed Juncos put out seed feeders. They especially like millet, so put that in your feeder. Dark-Eyed Juncos are not shy, and will come right up to your door if you put seed near your house.